Toronto, ON - February 27th, 2006 - Pixagent is glad to announce the release of four new PDF guides to walk users through setting up their wireless transmitter for the first time. These guides offer illustrated step-by-step instructions to walk users through the entire process of setting up ITP 2.0, their computer and camera for wireless transmission. In case any further problems come up, the guides also contain a comprehensive troubleshooting section to ensure users will be able to get their system up and running. Pixagent has been assisting users with their wireless transmitters since the original WT-1 first became available. Over this time, Pixagent has walked hundreds of people through the process of setting up their transmitters and solving any problems that may have come up. Thanks to this experience, Pixagent has been able to offer powerful tools to simplify this process and is in a unique possition to help solve even the most complicated problems. While Pixagent's ITP 2.0 offers a host of features to help simplify the setup process, there are still a number of steps that must be taken to get wireless transmitters working for the first time. To assist users in this process, these new guides walk users through the entire process - from installing ITP all the way to sending the first image. Each step in this process is provided with detailed instructions and accompanied by a screenshot to illustrate the necessary procedure. In case the user experiences problems once they have finished following the instructions, each guide also contains a comprehensive troubleshooting section. These sections cover the most common sources of errors and provide complete instructions on isolating the problem and finding a solution. As always, if additional help is required users are always welcome to contact Pixagent for further support. These documents are available immediately in the support section of Pixagent's website. 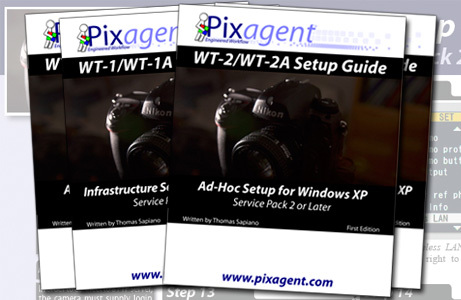 To assist users in selecting the appropriate guide for their situation, Pixagent's website contains detailed information covering the pros and cons of the various different configurations. To begin the process users should simply go to http://www.pixagent.com/support/guides/ and follow the provided directions.